The default style for each ODS destination is specified in the SAS Registry. For example, the default style for the HTML destination is DEFAULT and the default style for the RTF destination is RTF. You can specify a default style for all of your output in a particular ODS destination. This is useful if you want to use a different SAS style, if you have modified one of the styles supplied by SAS (see the section Style Definitions and Colors), or if you have defined your own style. For example, you can specify the JOURNAL style as the default style for RTF output. The recommended approach for specifying a default style is as follows. Open the SAS Registry Editor by typing regedit in the command line. Expand the node ODS DESTINATIONS and select a destination (for example, select RTF). Double-click the Selected Style item, shown in Figure 21.31, and specify a style. This can be any style supplied by SAS or a user-defined style, as long as it can be found with the current ODS path (for example, specify Journal). You can specify a default style for the other destinations in a similar way. If you save your style in SASUSER.Templat, verify that the name of your default style matches the name of the style specified in the SAS Registry. 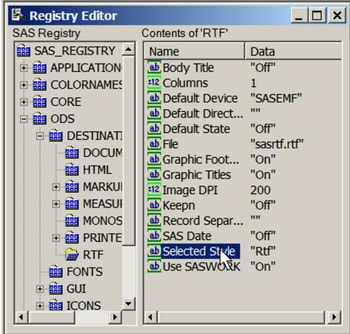 For example suppose the RTF style is specified for the RTF destination in the SAS Registry. You can name your style RTF and save it in SASUSER.Templat. This blocks the RTF style in SASHELP.Tmplmst (provided that you did not alter the default sequence in the ODS PATH). If you save your style in a user-defined template library, verify that this template library is the first in the current ODS PATH list. Include the ODS PATH statement in your SAS autoexec file so that it is executed at startup. For the HTML destination, an alternative approach for specifying a default style is as follows. From the menu at the top of the main SAS window, select Tools Options Preferences. In the Results tab, check the Create HTML box and select a style from the pull-down menu.